Cannoli is a Sicilian pastry originating in Palermo. A crisp tube filled with a sweetened ricotta cream. An authentic recipe of cannoli dough will contain Marsala wine. This provides not only flavor, and sometimes color and aroma, but gives the necessary acid to help with softening gluten. This dough will be quite stiff and requires kneading for development. It helps to rest the dough before rolling it out. When rolling it out, it is important to roll it out as thin as you can get it, as when it isn’t, it will end up being a thick, greasy fried tube, instead of the light crunchy pastry it’s meant to be. As they are frying, they tend to puff up and the outside will blister a bit to its characteristic surface. I used my pasta roller to roll out the dough as thin as possible. Enjoy! Sift dry ingredients. Cut in shortening with pastry blender until pieces are the size of small peas. Stir in eggs. Blend in wine, one tablespoon at a time, until dough clings together. Refrigerate several hours. Roll to paper thinness on floured surface. Cut 5- inch circles. 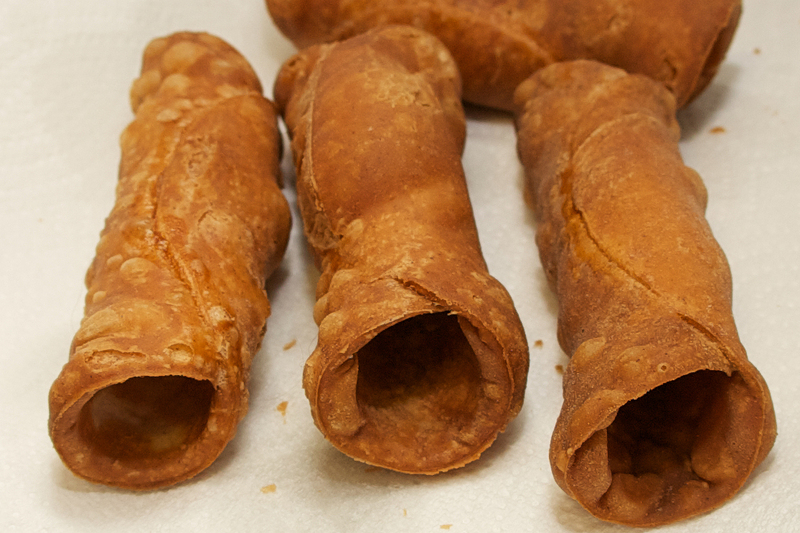 Roll around 6-inch stick or cannoli form. Wrap dough so that 1/4-inch of stick or tube protrudes at either end. Seal by brushing with beaten egg white. 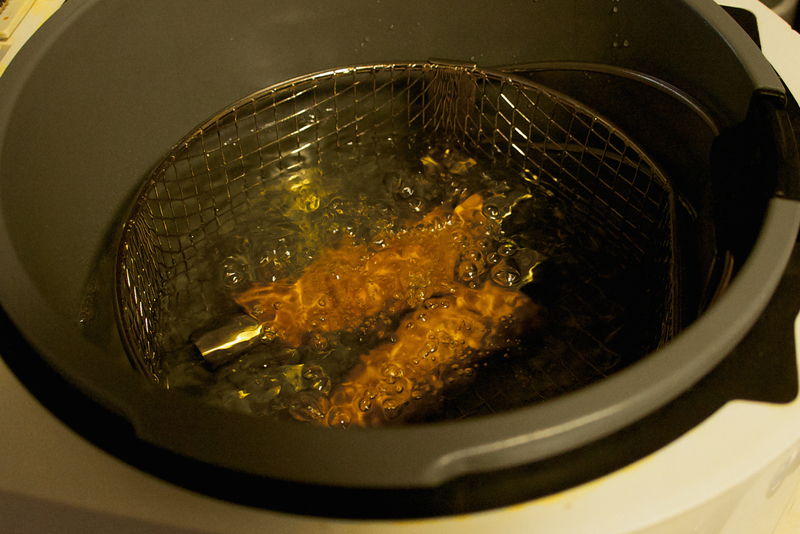 Fry 2 at a time in deep hot fat (375 degrees) for a minute or until golden brown. Lift with slotted spoon onto paper towel and cool. Remove sticks or tubes gently. Stir or beat on low speed ricotta, mascarpone cheese and sugar in large bowl for 1 minute. Add cinnamon, vanilla, citron, and then fold in chocolate chips. Always keep chilled when not using this filling. Fill shells using a pastry bag with tip. Sprinkle with confectioners sugar. Makes about 20 cannoli’s. Keep refrigerated until ready to eat. 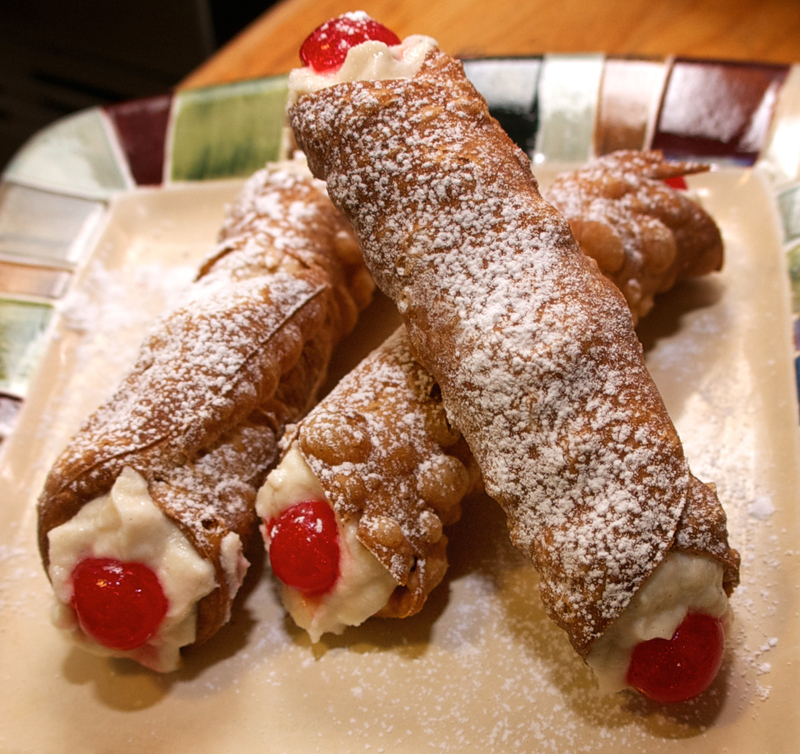 This entry was posted in Uncategorized and tagged cannoli, dessert, Italian, Sicilian. Bookmark the permalink. Thank you Paolo, they are a lot of work but oh so delicious.